This space wallpaper is a color-coded topography map of Juventae Chasma revealed by Mars Express. White and red show the highest terrains, while blue and purple show the deepest. This space wallpaper is a color-coded topography map of Juventae Chasma revealed by Mars Express. White and red show the highest terrains, while blue and purple show the deepest. The floor of Juventae Chasma sits some 3.6 miles (5.8 km) below the surrounding plateau. It is filled with sand in the southern part (left), which takes on a smooth appearance, in contrast to the northern (right) part of this image where many blocky rock fragments have slumped down from the chasma walls. 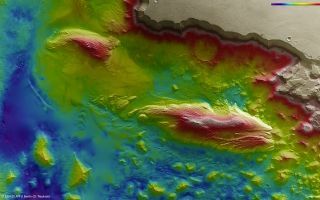 Two large mounds of layered material sit inside Juventae Chasma and comprise minerals altered by water. This image was released Dec. 12, 2013.